Young women still love those super-high heels with the straps. Bikini bottoms are just these little triangles, like the little flags kids used to have on the tails of their kites. A white guy in dreadlocks I don’t know. 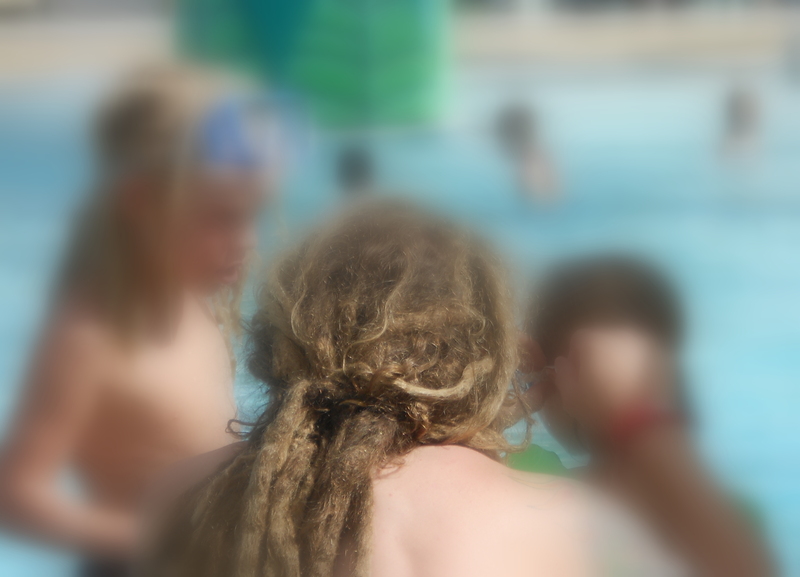 And here’s his kid in dreadlocks too. Will the kid get beat up? Mocked? Have his hair yanked by big mean boys? You worry. Hotel pools that let you eat and drink right by the water are awesome. The happiest-looking people around such pools are the ones who’ve sneaked away from the conference for an hour. You can tell them by their suit jackets, thrown over the back of their chairs. Salespeople are always pitching, they can’t help, it and male salespeople especially. By a hotel pool with surrounded by young women in small triangles of fabric what would you expect? 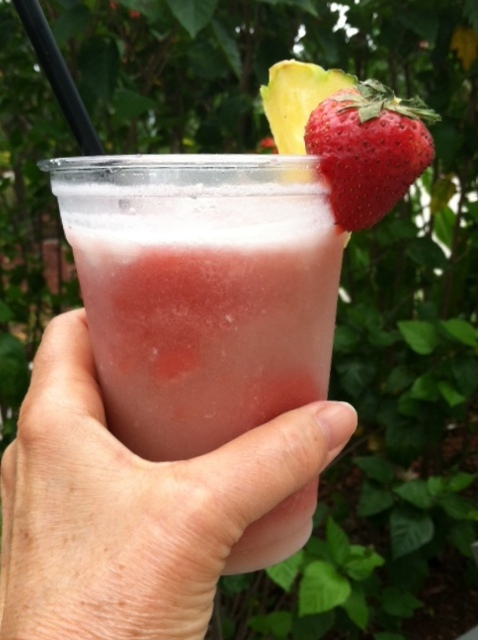 The strawberry piňa colada is a beautiful thing. A shrimp salad would be beautiful too if only you could figure out how to eat it from a lying down position. The state of Florida: what a great invention, now truly – and why not let your whole family have dreadlocks, right down to the family dog if that’s what you want. Amazing, all this from a simple little O-ring!! Start with the This and it will lead you to the All every time: this have I noticed! I saw those triangles in a store window in Bangor and I asked my husband why they were displaying bandit’s masks there. He said they were not masks. (learn something every day). That was quite a few years ago when Maine led the nation, if not the world.